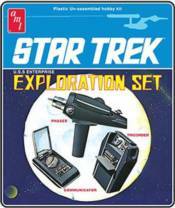 At long last, AMT re-issues the classic Star Trek kit of the Exploration Set! Star Trek modelers fondly remember this set of miniature prop replicas that features the iconic Phaser pistol, the all-purpose Tricorder hand-held computer, and the precursor to the modern cell phone, the Communicator. These items were made famous by the use of Captain Kirk and crew throughout the run of the classic TV series. The Star Trek Exploration Set 1:3 Scale Model Kit includes pictorial assembly instructions and a re-mastered decal sheet. Glue and paint required, not included. Skill level 3. Ages 12 and up. TIME TO SOW: STAR TREK (ST: TNG) TREKKERS GUDE TO COLLECTIBLES - UNAUTHORIZED 2ND ED.